A Life of Sugar and Spice: Join the party!! 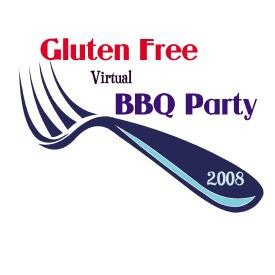 One of my favorite gluten-free blogs - Gluten Free Gobsmacked - is hosting a virtual GF BBQ! Everyone picks a letter and makes a dish, my letter is P and I will be making Pasta Salad, Tinkyada of course! I am not exactly sure what will go into it yet but I have to make it tonight since I have to post the recipe and photos by tomorrow. I think this is such a fun and great idea, I've been wanting to make some GF pasta salad for awhile so this was a great motivator. I have a bunch of veggies at home already and the pasta so I might whip something up with what I've got on hand. I just have to decide how I'm going to dress it. Hmmmmm. I'm feeling a lot better today. I know that this GF lifestyle is a piece of (gf) cake if I put my mind to it. I'm already seeing a lot of positives. My skin is so clear. I've had trouble with blemishes and mild acne for years and years and in the past two weeks my face has become smooth and just lovely. It is amazing. And still NO RASH! A huge sigh of relief on that one. I definitely have a little more energy but that's still slow to come around. I read through Allie's entire blog the other day and I noticed that in one post she commented on how her energy levels hadn't really changed much at first, but in a later post she noted that she eventually had a big increase in energy so I'm looking forward to that day. It's a rainy day here in Boston, I hope it clears up for the weekend. I'm so glad it's Friday, this has been a long week. I have plans to do absolutely nothing this weekend and I am totally pumped for it! Have a great Friday everyone. Thanks for visiting and commenting at my blog. I am pleased to discover a new person to add to my musat read blogroll. I hope you have a great do-nothing weekend. Hang in there - the diet is worth it. Wahoo! You ROCK, Girl! Thanks for publishing this post - I hope people will join enough to fill up the entire alphabet. YAY a virtual BBQ - how fun is that! Pasta salad should be fun!